It’s that time of year again at Pyramid Lake when the fishing is off the hook, and the Lahontan cutthroat trout are on the feed. March is a top producing month at the big pond, and April can be very productive as well. The entire season has fished better than normal this year, even with the cold water temperatures during February. With an active weather pattern in the last week that will continue into this coming weekend, conditions are near perfect. The wind is your friend at Pyramid Lake, especially if it is blowing into shore, driving in the fish that cruise the first ledge in search of a meal. The key to being successful at the lake is being in the right spot, at the right time. These cutthroats move around depending on the best source of food, and the currents. Any beach can be hot at any given time. One way to determine if the fish are at a certain location, is to watch anglers fishing. If you see multiple bent rods in a line up, it’s a sure bet the fish have moved in. My connections at the lake which include the top guides, and die hard regulars, have been hooking into some very large cutthroats of epic proportions lately. Some anglers are reporting multiple 10 pound plus fish days. Many of these fish are the Pilot Peak strain that were introduced several years ago. The story of the reintroduction of the Pilot Peak strain is amazing. During the 1970’s near the ridges of Pilot Peak in North Eastern Nevada, a small isolated population of cutthroat trout was discovered. Fisheries biologist at the time thought these specimens could be the remains of the original Lahontan Cutthroats that in habited Pyramid Lake, and the great Lake Lahontan. It was all speculation until some 20 years later that a professor from the University of Nevada began experimenting with a new method of genetic analysis that could recover DNA from museum specimens collected in the 1930’s. The DNA matched perfectly with the cutthroats found on Pilot Peak. Since then, the Gardnerville Hatchery has been releasing the original strain back into Pyramid Lake with great results in both length, and girth. It’s only a matter of time before the 30 pound mark is broken in this modern day. The other strain of the Lahontan cutthroat in the lake is referred to as the “summit” strain which were planted in Pyramid Lake after the extinction of the Pilot peak strain in 1943. The Pilot Peak’s demise was caused by dam diversions, overharvesting, sawmill pollution, degraded spawning habitat, and competition from other nonnative trout in the Truckee River watershed. The Summit strain does not grow as big as the Pilot Peak strain, but the average size is greater than most still waters found in the west. In the weeks to come the Summit strain will be schooling up in big numbers and preparing to spawn at the Sutcliffe Fish Hatchery on the lake. The Pilot Peak cutthroats start their spawn weeks later. Making vertical presentations with an indicator near the first drop off is starting to produce, and will continue to get better the further into the spring season. The length of your bottom fly to the indicator can range from 7 to 10 feet, experimentation is often required to find the sweet spot, and the most effective depth. Top producing flies for this rig include the Maholo nymph, and the Maholo midge in colors of wine, black, purple, and red. Copper Johns are also effective in the same colors, with some anglers using a bright blue color. Stripping flies with fast sinking 250 grain sink tip lines continue to be another proven method on the sandy bottoms of the drop off. Classic buggers like the Midnight Cowboy, and the Olive Martini are great choices with a popcorn beetle, or a pollywog as a trailing fly. It’s not technical fishing by any means, but more about finding active feeding schools of fish. The time to fly fish Pyramid Lake is now, so gather your cold weather gear, a ladder, and your 8 weight rod to experience your best shot at catching a 20 plus pound trout. A great source of information can be found at pyramidlakeflyfishing.com where you can find out about current regulations, lodging, weather, and how to obtain your fishing License from the Pyramid Paiute Reservation. 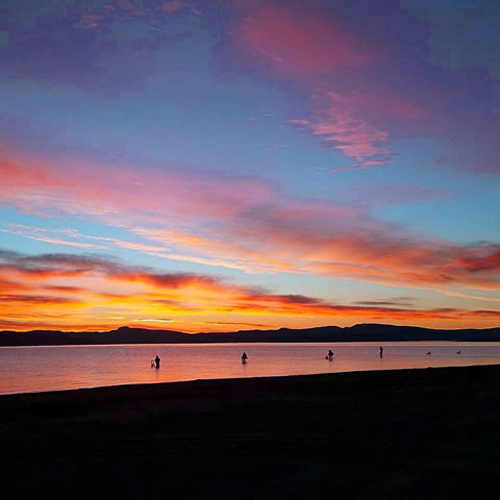 Photo Information: Fly anglers are often rewarded with fantastic sunrises at dawn. Photo by Chris Evison.